Bonnie Tyler (born Gaynor Hopkins, 8 June 1951) is a Welsh singer, songwriter, and philanthropist. She has had several major hit songs. Three songs, "Lost in France", "It's a Heartache" and "Total Eclipse of the Heart", became major hits in the late 1970s and early 1980s. Tyler represented the United Kingdom in the Eurovision Song Contest 2013 in Malmö. Tyler in Moscow, Russia, 6 May 1997. 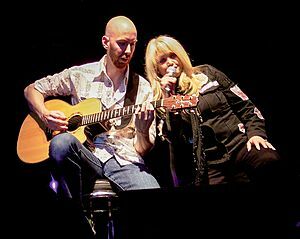 Bonnie Tyler with Matt Prior performing in Soria, Spain (20 July 2006). Bonnie Tyler at the sound check for her concert in Dolina Charlotty, Poland, 1 May 2011. Bonnie Tyler Facts for Kids. Kiddle Encyclopedia.